PeopleWeaver is a nonprofit organization established to help impoverished women in developing countries. Economic assistance, such as microcredit loans, is provided to help these women generate more income. This, in turn, allows them to become community role models and have more fulfilling lives. Successful microcredit loans help not only the women, but also their children and their communities. This prosperity contributes to improved health and nutrition, and also increases opportunities for educating the next generation. 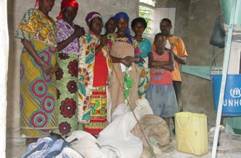 Although the primary focus of PeopleWeaver is to make microcredit loans to help make recipients self-sufficient, aid also has been provided for food, supplies, medicine, eye glasses, children’s shoes, communication tools, schooling, business workshops, and two cooperative grain mills. Currently, PeopleWeaver concentrates its efforts on the Congolese women refugees living in the Kyangwali Refugee Settlement in west-central Uganda. The Kyangwali Refugee Settlement was established in the 1960’s and is located in west-central Uganda, 220 kilometers from Uganda’s capital, Kampala, and 80 kilometers from Hoima, the nearest town. Kyangwali hosts approximately 18,000 Congolese and Sudanese refugees. There also are small numbers of Rwandan, Burundian, Somali, and Ethiopian refugees living in the settlement. Upon arrival, each family is given land to farm, land for a dwelling, and enough supplies to last six months. By the end of this six month period, each family must be self-sufficient. In the past, the women-led family groups tended to work alone, but the microcredit meetings have resulted in close personal and business bonds between the women. The loan recipients living in Kyangwali have organized a group which they named “Wamama Tuungane” (“Women Come Together” in Swahili) and have elected group officials. Wamama Tuungane has become a strong, positive force within the community, and has been recognized by the settlement commandant. 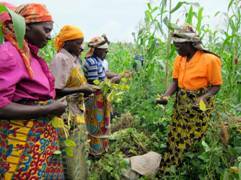 The Wamama Tuungane group has rented land and established a farming cooperative. This effort has been so successful that the Kyangwali commandant recently provided an additional plot of land. They use their mill cooperatives to grind their own grain, selling what they don’t need to feed their own families. For non-members, grain is normally milled for a fee, although it sometimes is done for free for the very needy. With the profits from the mills, the women have started giving small microcredit loans on their own. PeopleWeaver is planning to start new microcredit groups in other areas, such as Bunagana in the Democratic Republic of the Congo. (Many of the Congolese refugees fled from the Bunagana area due to rebel attacks.) 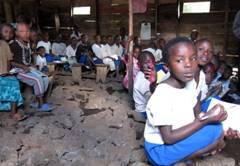 In Bunagana, PeopleWeaver saw many needs for aid: school children sitting on rough rocks because there aren’t enough desks, a school without classrooms for many students, teenagers planning to create a hostel near their school so they don’t have to walk miles to attend, and a high school with empty classrooms because the rebels used the desks for firewood. These were just a sample of the needs which were identified. PeopleWeaver is based near Boulder, Colorado. Through continual communication and several trips to Kyangwali, led by Jeanne Ratzloff, the President of PeopleWeaver, the organization has established personal relationships with the people who receive loans, the people who benefit from community-based projects, community leaders, settlement administrators, and the Congolese refugees who administer PeopleWeaver’s projects. PeopleWeaver is certified by the United States government as a Section 501(c)(3) nonprofit charity. This means all donations to PeopleWeaver are tax-deductible. Donations are used entirely to finance projects. All administrative and travel expenses are borne by the organization’s founders to ensure that 100% of all donations go to the Congolese people. I am honored to know Jeanne Ratzloff, president of the PeopleWeaver organization, since many years, and I had the privilege to learn about her tireless work to make these charitable efforts for the women and families who live in Kyangwali possible. Jeanne not only told me about the challenges, but also of the hope, will power, and courage these brave women have in spite of the difficult conditions they face every day. PeopleWeaver’s work for and dedication to women in Uganda is an inspiration. It is why we here at Take The Magic Step are motivated and thankful to support this organization in its mission to help underprivileged women escape poverty so they and their families can live better lives. © Copyright Uta Pippig. All Rights Reserved.